WhatIfSports.com simulated the entire Stanley Cup Playoffs 1,001 times using its NHL simulation engine. The simulation generated every team's odds to advance in each round of the playoffs. 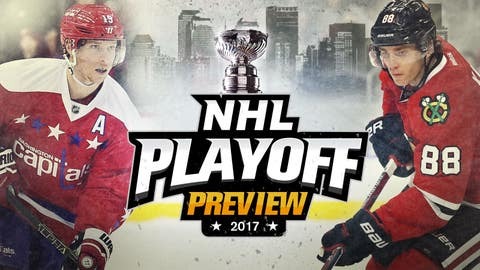 See which team is favored to hoist Lord Stanley's Cup. 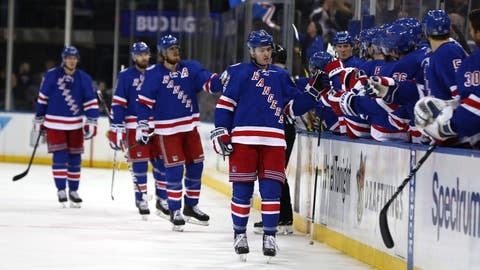 The Atlantic Division champion Canadiens and the Rangers are meeting in the playoffs for the first time since the 2014 East final that featured tensions rising and suspensions getting handed out. New York’s Chris Kreider ran into Montreal goaltender Carey Price, injuring him and knocking him out of the series. Players have long memories, so expect it to be another physical series. Series Prediction: New York wins 68.0 percent of the time, with an average series length of 4-2. Coming off shattering his career high with 85 points — and being suspended for spearing — Brad Marchand will have to be the key if the Bruins make a run. 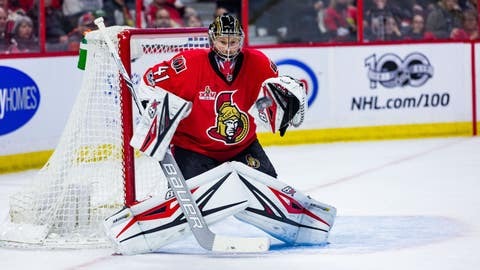 The suffocating Senators are up first and have home ice, but if Marchand can get on a roll and pile up the points, Boston won’t be an easy out for anyone. Series Prediction: Ottawa wins 59.2 percent of the time, with an average series length of 4-3. The Capitals aren’t the perfect opponent for Auston Matthews and the Maple Leafs’ first playoff series. Toronto has nine players who haven’t played in an NHL playoff game, but coach Mike Babcock doesn’t want anyone to wade into games this time of year. Series Prediction: Washington wins 91.4 percent of the time, with an average series length of 4-0. The Penguins will be without top defenseman Kris Letang and no team has repeated since the Detroit Red Wings in 1997 and 1998. But they still have 2016 playoff MVP Sidney Crosby and more. The first-round rivalry series also features John Tortorella facing longtime assistant Mike Sullivan a year after his good friend and former understudy matched him with one championship. 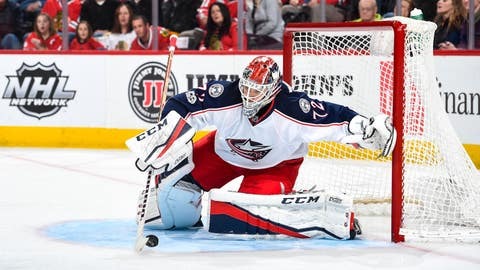 Series Prediction: Columbus wins 77.6 percent of the time, with an average series length of 4-1. 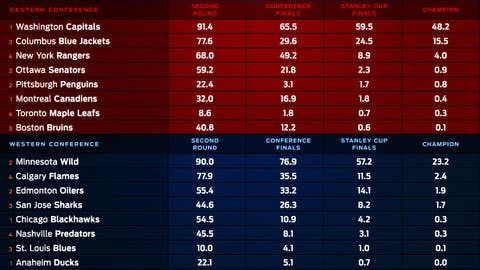 Every team's round-by-round odds to advance, including Stanley Cup odds for each team. Jonathan Toews, Patrick Kane, Duncan Keith, Brent Seabrook and Marian Hossa are just part of the veteran group that propelled the Blackhawks down the stretch to the West’s top record and the NHL’s third-best performance since New Year’s Day (58 points). Yet these Blackhawks have been refreshed by an infusion of youngsters hoping for their first taste of Stanley Cup glory, most notably Artemi Panarin. 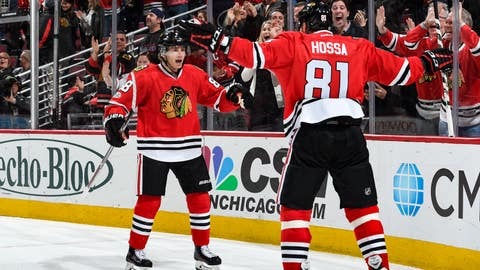 The high-scoring Russian is in only his second NHL season, and his first postseason run ended abruptly last year with Chicago’s first-round loss to St. Louis. The Predators were Chicago’s first-round postseason opponents before the Blackhawks’ Stanley Cup title runs in 2010 and 2015. Nashville’s record (41-29-12) was nearly identical to last season’s mark, but the Predators have made one big change: P.K. Subban replaced Shea Weber as their top defenseman this season, headlining a blue-line corps including Roman Josi and Ryan Ellis in front of goalie Pekka Rinne. Series Prediction: Chicago wins 54.5 percent of the time, with an average series length of 4-3. Minnesota was cruising toward the Central Division title before a late-season slump, while the Blues surged into the postseason after firing coach Ken Hitchcock and trading top defenseman Kevin Shattenkirk. Both teams are regular playoff qualifiers, but both are hoping for a breakthrough this spring after years of disappointment. Keep an eye on Minnesota goalie Devan Dubnyk, whose proficiency against Vladimir Tarasenko and the Blues’ scorers could determine this series. Series Prediction: Minnesota wins 90.0 percent of the time, with an average series length of 4-0. Anybody who is aware of the Flames’ 25-game regular-season losing streak at Honda Center could be excused for thinking the Ducks have an astonishing home-ice advantage in this matchup of the five-time defending Pacific Division champions and the West’s top wild card. 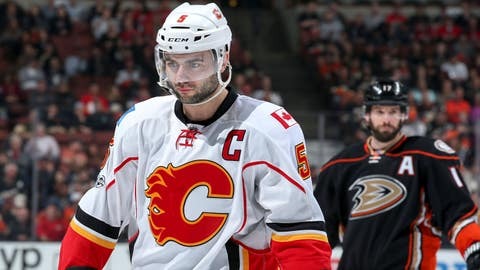 The Flames are loaded with young talent, but this series rests heavily on Ryan Getzlaf, Corey Perry, Ryan Kesler and the rest of Anaheim’s veteran core, which simply hasn’t been able to finish: The Ducks have lost a Game 7 at home in each of the last four postseasons. The Ducks streaked into the postseason on an 11-0-3 roll, and they have more talent and experience. 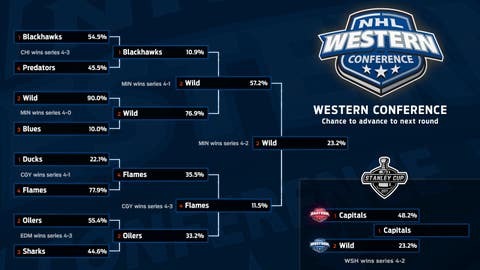 But after Anaheim’s first-round flop against Nashville last season, the Flames realize they might be facing some sitting Ducks in their quest for a playoff breakthrough. Series Prediction: Calgary wins 77.9 percent of the time, with an average series length of 4-1. 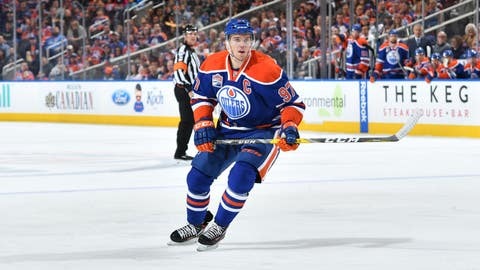 Connor McDavid will make his Stanley Cup playoff debut at Rogers Place’s first postseason game on Wednesday night, and the hockey world can’t wait to see what he does next. McDavid already won the NHL scoring title and led Edmonton back to the postseason after a 10-year absence. The Oilers even finished above the Sharks, who have much the same team that won the West last season. San Jose might be far from full strength: Centers Joe Thornton and Logan Couture are out with injuries, and it’s unclear when they’ll return. But Brent Burns and Joe Pavelski are ready to apply their full range of playoff knowledge against the upstart Oilers and McDavid, who might be at the start of the best chapter yet in his remarkable story. Series Prediction: Edmonton wins 55.4 percent of the time, with an average series length of 4-3.